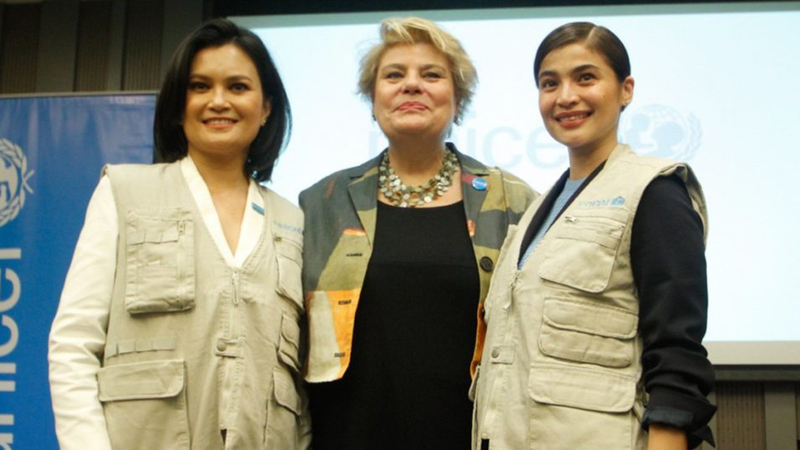 Celebrity advocates Daphne Oseña-Paez and Anne Curtis were named United Nations International Children’s Emergency Fund (UNICEF) National Goodwill Ambassadors on Thursday. In a press conference at Novotel, Quezon City, UNICEF Philippines Representative Lotta Sylwander conferred the title to both Paez and Curtis for their work in promoting and protecting the rights of the Filipino children. “UNICEF Goodwill Ambassadors are well-known personalities who lend their influence for the well-being of children, who are willing to do their utmost to mobilize support for children. They are volunteers who demonstrate a high level of commitment to children and to the organization,” Sylwander said. “We welcome Daphne and Anne into the UNICEF family as new UNICEF National Goodwill Ambassadors because of their strong dedication and drive for results for children throughout all these years,” she added. “Being a mother to three daughters, I strongly identify with UNICEF’s values and vision for children’s growth, development, protection and participation,” she said. “There is still much more to be done but I believe we all can play our role to bring smiles to children’s faces,” she said. TV host, producer, and entrepreneur, Paez has been a UNICEF advocate since 2010. Also an advocate for breastfeeding, she has been involved in infant and young child feeding, maternal health and maternal mortality, universal primary education, nutrition and child protection. Paez’ flagship project for UNICEF Philippines is “Auction for Action”, an art auction that brings together top Filipino artists in design, furniture, art and jewelry for a good cause. The auction is a product of UNICEF and Paez’s collaboration to bring the world of art, furniture and design, together with her advocacy for children. Paez has travelled to many parts of the country to meet children and mothers and witness UNICEF in action. Actress, model, television host, recording artist and entrepreneur Curtis has been a major donor to UNICEF since 2009, until her close involvement with UNICEF led her to being appointed as celebrity advocate in 2014.